GPS Trader Review - GPS Trader is a Scam! GPS Trader found at gpstrader.co may be promising to make you $20,000 within 24 hours, but don’t be fooled – because GPS Trader is a scam! We’ve documented the lies told by Richard Heffner in this GPS Trader review, so make sure you read it before plunging into an obvious scam! GPS Trader scam making some outrageous promises. GPS Trader is one of the newer binary trading software scams that gets introduced to the arena, and it’s highly exaggerated. As soon as you go into the website of GPS Trader, you’ll be introduced to an eye-catching headline and an auto-play video. This is a standard template for most binary softwares, and GPS Trader scam is no exception. 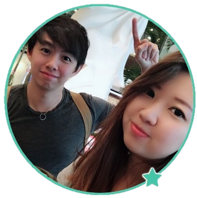 I accessed the website in Singapore, and the headline reads: FREE GPS Trader App WILL Generate You $850 per HOUR Trading on Auto Pilot Free. Notice how they use the word FREE twice in a row? Along with promising an extraordinary earning of $850 per HOUR on Auto Pilot? All these words are carefully targeted at the audience who wants to make quick bucks from the internet with a magic push-button software. It’s a clever marketing tactic used to grab the visitor’s attention and make them watch the sales video. It’s in the sales video where Richard Heffner, the alleged owner of GPS Trader scam tries to brainwash you into signing up for the software. Does GPS Trader app runs on auto pilot? Yes it does. But does it come free? No it doesn’t, you have to deposit at least $250 to get started. And it certainly won’t make you any profits, let alone $850 per hour. Facebook testimonials for GPS Traders scam are fake. 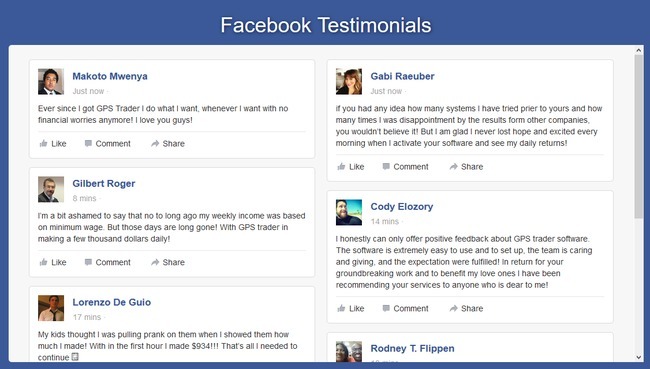 If you scroll down below the sales video of GPS Trader scam, you will come across a “Facebook Testimonials” section where they display what seems to be authentic Facebook posts. But if you look closer, you’ll realize that this is a trick by GPS Trader scam to confuse its victims. These are actually just wall of texts customized to look like Facebook posts, and they are not from Facebook at all. None of the names and profiles is real. If you want to verify the authenticity for yourself, you can look for any of the names shown in the page on Facebook. You won’t find anyone with the name and matching profile picture. Why Are There Reviews Glorifying GPS Trader Scam? Affiliates are paid to promote GPS Trader scam. If you are the kind of consumer who reads multiple reviews before making a purchase, you may have realized that some reviews are endorsing GPS Trader scam. If GPS Trader is really a scam, why would there be reviews glorifying it? Turns out, GPS Trader scam is paying any affiliate marketer a handsome commission of $250 if they successfully refer a new victim to the scammers. That’s the reason you see so many fake reviews out there. Sadly, in cases like these, the reviewers are swayed by the commissions and choose to endorse scams. As an internet marketer, it’s inevitable that I endorse products too, but I choose to recommend only products that genuinely help people. I could’ve written a raving review for GPS Trader scam and encouraged my readers to sign up, and I’ll earn a nice $250 commission once they deposit into their trading accounts. In fact, it’s a lot easier to write than to look for evidences and expose this scam. However, I’ve been a victim of binary software scam before and I don’t want my readers to end up the same. I do realize that I’m revealing the secrets of many affiliates out there, but this is what I’ll do if it means saving a few of my readers from the scam. YES, GPS TRADER IS A SCAM. We strongly advise you to stay away from the scam if you don’t want to lose your hard-earned money. The Money Glitch Review – Money Glitch Scam!